This post is sponsored by my friends at NESTEA, but the thoughts and opinions expressed here are my own… just as always! ???? 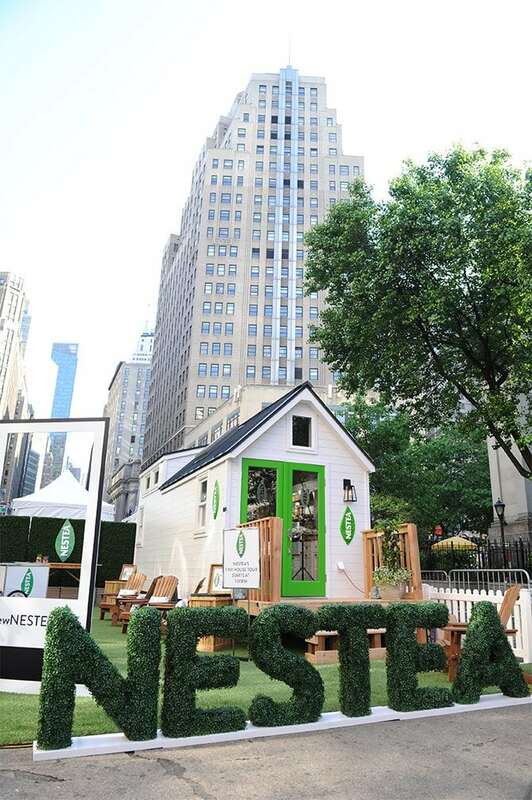 We handed out thousands of samples for folks to be able to try NESTEA’s new simpler recipe with fewer ingredients and they got an opportunity to take a tour of the Tiny House. Get your own taste of the new NESTEA. It was a great way to show people how even in the craziness of a busy city like NYC, that the idea of “less is more” can have a huge impact on quality of life. As part of the launch, I also created a recipe that emphasized that idea that meals don’t have to be complicated and require a bunch of expensive ingredients to taste amazing. 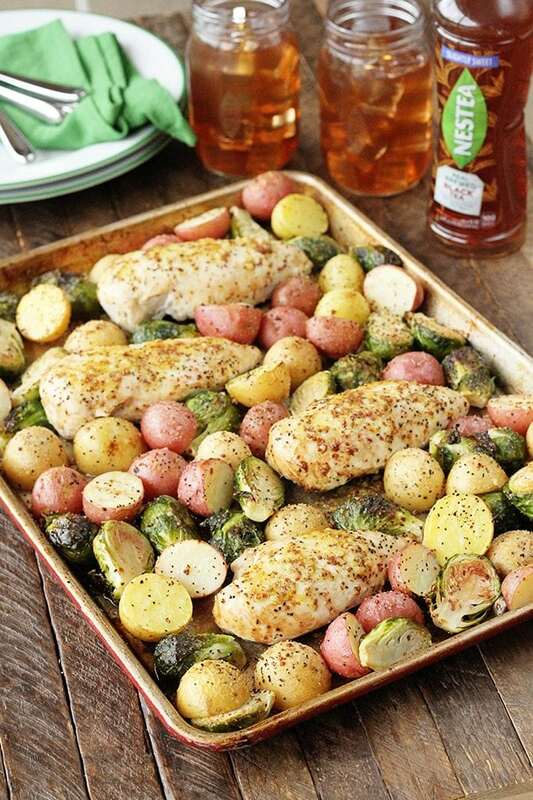 This Sheet Pan Lemon Chicken is the perfect example. We even handed out recipe cards to show everyone how easy it can be. 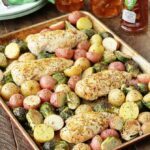 It’s filled with great tangy, tart flavor and everything cooks on one pan – chicken, potatoes, Brussels sprouts, the whole deal – and you’ll only dirty up one small bowl and a sheet pan. You can also line the sheet pan with heavy duty aluminum foil for even easier clean-up! To start, preheat the oven and spray a rimmed baking sheet with nonstick cooking spray. 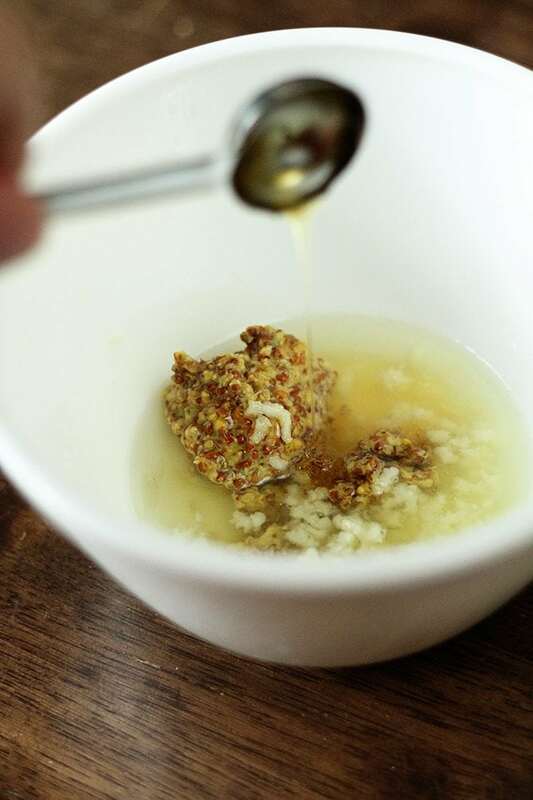 In a small bowl, whisk together half the lemon juice with the mustard, garlic, honey, and 2 tablespoons of the olive oil. 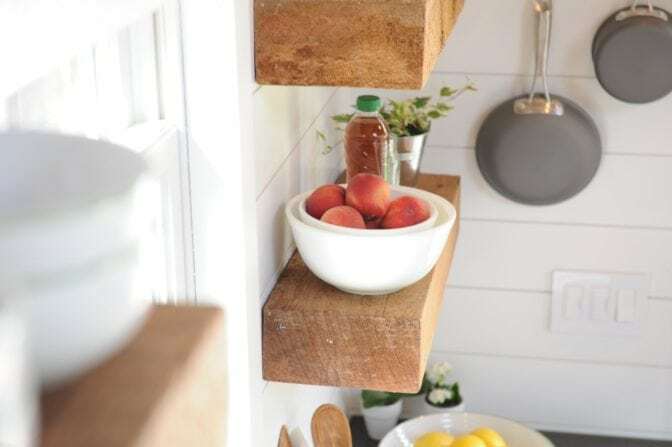 These great white bowls in the picture above are just one of the simple, but functional items I included in the NESTEA Tiny House kitchen. They have the classic look of antique milk glass, but are perfect for all kinds of uses. 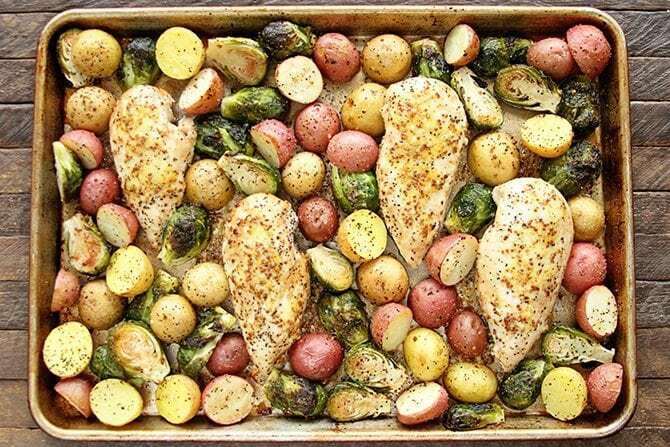 Next, place the potatoes and Brussels sprouts on the sheet pan and drizzle with the remixing 2 tablespoon of olive oil and about half of the lemon mixture. Toss them to coat, then season generously with salt and pepper. Spread them evenly on the pan leaving four spaces for the chicken breasts. Next, season the chicken breasts with salt and pepper and place them on the sheet pan. Drizzle the remaining lemon mixture over the chicken. Bake for about 25 minutes or until the potatoes are tender and the chicken is cooked through. 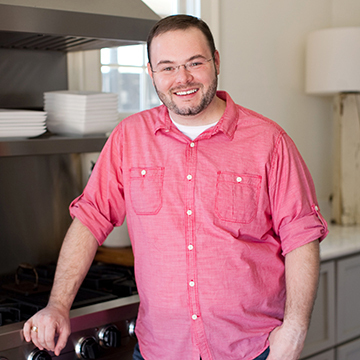 A meat thermometer will read 165° when they are cooked completely. Serve straight from the sheet pan or move to a platter for a prettier presentation, then drizzle with the remaining lemon juice. Either way, your family is going to love this meal. And it’s SO easy! Preheat the oven to 400°F and lightly coat a rimmed baking sheet (jelly roll pan) with nonstick cooking spray. In a small bowl, whisk together half of the lemon juice, mustard, garlic, honey, ¼ teaspoon salt, and 2 tablespoons of the olive oil. Set aside. 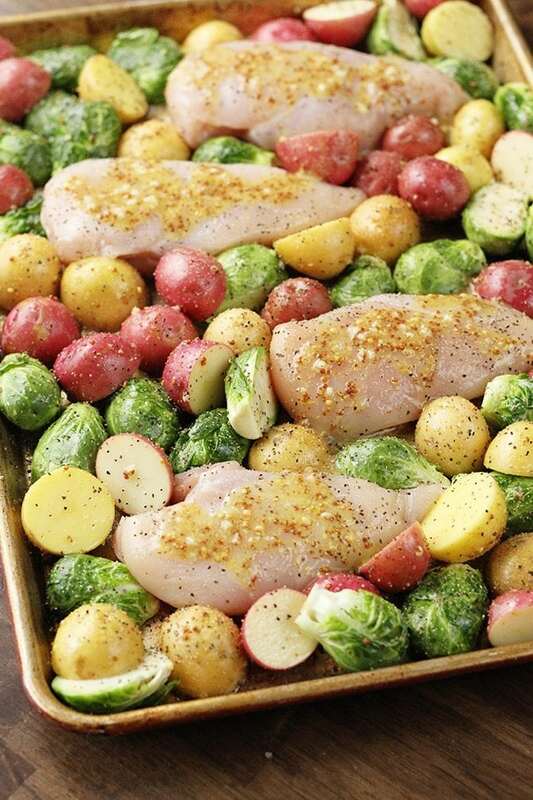 Place the potatoes and Brussels sprouts on the pan. Drizzle with the remaining 2 tablespoons of olive oil and about half of the lemon mustard mixture. Toss to coat. Season generously with salt and pepper. Spread evenly on the pan. Season each chicken breast with salt and pepper and place them on the pan also. Drizzle the remaining lemon/mustard mixture over each chicken breast. Bake for 25 minutes, or until the potatoes are tender and the chicken is cooked through. Drizzle with the remaining lemon juice. Serve immediately. This looks wonderful!! Can you substitute asparagus for the Brussel sprouts and, if so, does the cooking time or temp change? Absolutely! The cook time is really more related to ensuring the chicken is cooked through. The asparagus might be a little soft, it’s all about how you like it. Please save your time and ingredients this was a total waste of time waste good ingredients. When cooked for 25 mins. chicken was raw potatoes hard pan juices were burned cooked 15 mins. longer and brussel sprouts burned and chicken still not done. I am an experienced cook and could not save this disaster! Hi Anna! So sorry to hear you had trouble with this one. I’ve made this a number of times and haven’t had these issues. I obviously can’t control the size of the chicken breasts you used or what size your potatoes were cut, which seem to be the issue. I can assure you though, that I’ve made this a number of times using these instructions and everything has cooked perfectly. 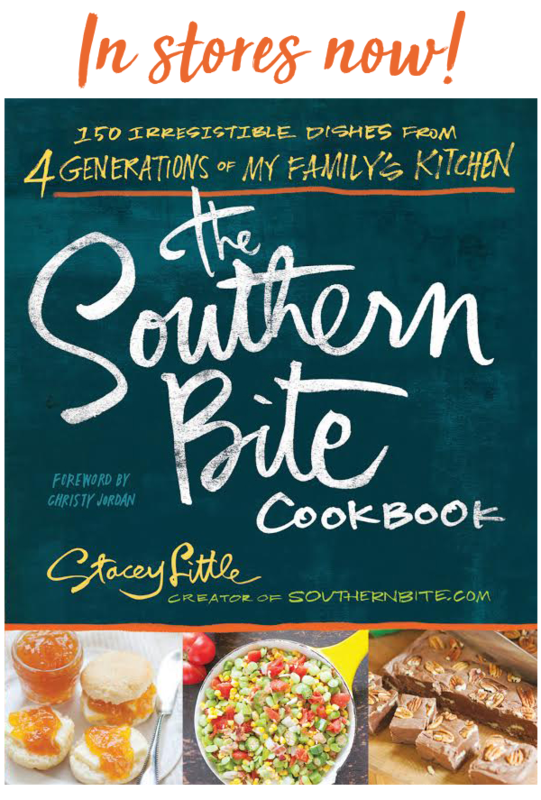 Every recipe on SouthernBite.com is tested over and over again before it makes to the blog. I followed the recipe exactly and it was perfect. Also added sweet potato, and carrot to the potatoes and brussel sprouts. Chicken was perfect. You likely used frozen or cold chicken or need to get the oven checked. So glad you enjoyed it, Richard! Thanks for letting us know it all turned out well for you! This is amazing! Gotta try it this weekend! Made this tonight exactly like the recipe and it was perfect! I did cook mine about 10 minutes longer to make sure my chicken was completely done. It was wonderful to only have one bowl and one pan to clean up after and it was so easy to thro together and let the oven do all the work!! Awesome! So glad that it turned out great for you!! What kind of mustard & can the Brussel sprouts be frozen? I wouldn’t recommend using frozen sprouts. The recipe calls for coarse or stone ground mustard. Turned out great! The directions where it says to drizzle the remaining 2 tablespoons of olive oil…well I read olive oil as lemon juice 😂😂😂. My one little screw up didn’t ruin the dish! Potatoes and chicken were tender. I flattened down the chicken so they would cook all the way through at the allotted time. Brussels sprouts were good as well…it was my first time making them so I was nervous. My husband said they were a little heavy on the lemon flavor but still tasted good. Will be adding ths to pair dinner rotation! So glad to hear y’all enjoyed it, Stephanie!